For a while there, the march of Ultrabooks was comprised almost entirely of halo products: skinny, relatively expensive things designed to help Intel and its OEM partners make a good impression on the general laptop-buying public. But with 110-plus models in the pipeline, they can't all be expensive, right? By now, you may have noticed that Ultrabooks are starting to look a little less uniform: there have been larger ones, heavier ones, some with optical drives, some with discrete graphics. Next up: cheaper ones. Just in time for back-to-school shopping season, we're seeing a wave of more reasonably priced Ultrabooks, many of them with traditional spinning hard drives and slightly heavier frames. One of these is the Lenovo IdeaPad U310, a machine that brings Core i5, 4GB of RAM and hybrid storage for $799. 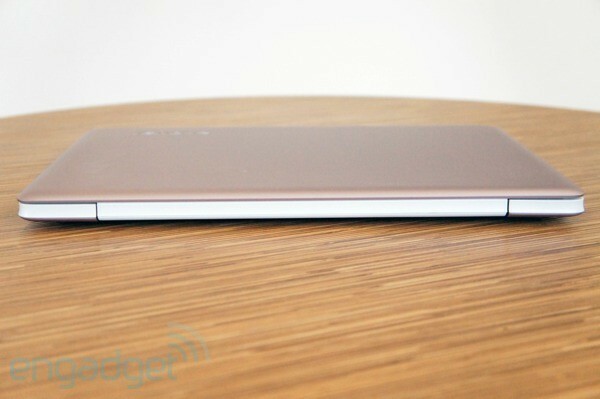 Oh, and its design is pleasantly reminiscent of the IdeaPad U300s, a higher-end Ultrabook we reviewed late last year. No doubt, then, it'll be a tempting option for people who can't afford to spend $1,000-plus on a laptop. But is it worth it? Let's find out. The U310's design, keyboard and trackpad make it a tempting option at this price, but be prepared to make a few compromises around performance and portability. 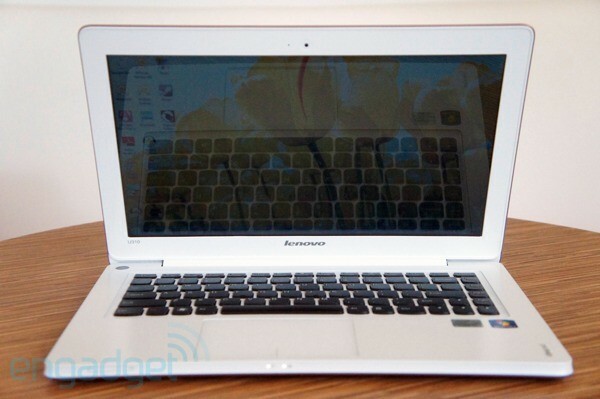 Be the first to review the IdeaPad U310? With a name like the U310, you might expect this guy to be a modified version of the U300s we reviewed last year. And you'd be mostly right. Like the U300s, the U310 isn't so much wedge-shaped as book-inspired. The chassis is evenly thick throughout (about 0.7 inches) and the sides have some subtle scooping, making the closed laptop look like a bound book with pages stuffed between the two covers. Is there any ergonomic benefit to that? Surprisingly, yes: the fact that the lid protrudes slightly when shut makes the notebook especially easy to open. Other details have carried over from the U300s, too. There's the spun metal power button, for one, which glows white when the machine is powered on. The bottom side is also fairly clean, save for a vent stretching across it. Four rubbery feet help protect that metal surface from nicks and scratches. The big difference is in the build quality. While the U300s is fashioned out of a single piece of aluminum, the U310 makes do with a metal lid and bottom cover, with plastic coating the bezel and keyboard deck. (As if to emphasize the difference in target audience, the U310 is offered in a less serious color palette, including "Cherry Blossom Pink," "Aqua Blue" and a more staid "Graphite Gray.") In any case, for a system constructed largely from plastic, the U310 still looks and feels good. The entire keyboard deck has a matte finish with a slightly metallic sheen, which makes it resistant to both scratches and unsightly fingerprint stains. All told, the homeliest part of the laptop might be the bezel, which is made out of glossy, reflective plastic. Truly, it's the biggest tell-tale sign that this is a budget machine and not a premium system. Another other major differentiator? The U310 is slightly thicker than the U300s and heavier too, at 3.75 pounds (versus 2.95). Still, that extra girth means room for some additional ports -- namely, an Ethernet jack and HDMI output. (The chassis actually widens slightly where the Ethernet connection is, suggesting Lenovo really didn't have much room to spare here.) In addition, you'll find three USB ports (one 2.0, two 3.0) and an audio jack. Finally, there's an SD reader, which was inexplicably missing on the higher-end U300s. It's refreshing to get hands-on with something whose buttons actually move when you press them. Is there a company that knows more about keyboard design than Lenovo? For years, legions of touch typists have been choosing ThinkPads purely on account of those tactile keys, and though the engineers designing IdeaPads work in a completely different division, you have to imagine some of that keyboard know-how has trickled over into the consumer side of the house. Actually, let's clarify that. The AccuType keys you see here aren't the dense, pillowy buttons used on ThinkPads of yore. Rather, they're very similar to the island-style keyboards you'll find on newer ThinkPad laptops, which just made the transition to a new layout. 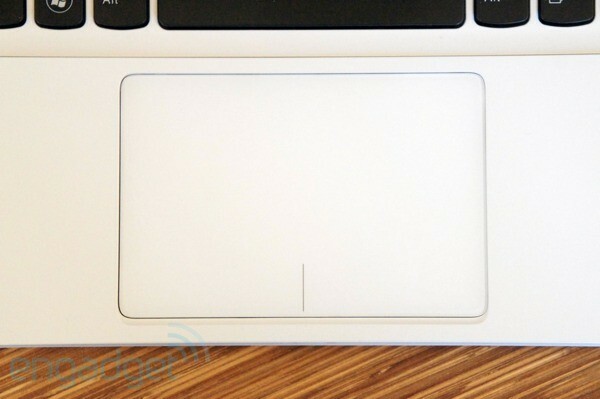 That caveat aside, the shape, pitch and overall feel of the keys is comparable to what you'd get on a ThinkPad. Particularly after testing Ultrabook after Ultrabook with shallow keys, it's refreshing to get hands-on with something whose buttons actually move when you press them. They also have a slightly textured finish, which makes it that much easier to anchor your keys while you're typing. Nonetheless, this is not a perfect keyboard. For one, as stocky as the individual keys are, the underlying panel isn't nearly as sturdy -- we could feel the deck give a little as our word-per-minute rate started to pick up. More importantly, though, the pleasant spacing between the keys seems to come at the expense of non-letter buttons, such as Enter, Tab and Caps Lock. All of these auxiliary keys are undersized, and, particularly if you're not used to the layout, you might find that your finger lands on the Delete key when you meant to hit Backspace. The U310 has a spacious glass clickpad that responds surprisingly well to pinch-to-zoom. It even fares well with two-finger scrolls, though we noticed that thanks to the slick, low-friction surface, scrolling wasn't as deliberate and controlled as on the Samsung Series 9, which we happened to be testing around the same time. Happily, though, because the pad offers so little friction, it's easy to drag the cursor across the screen with one finger. Also, that line demarcating the right and left click zone makes it less likely that this pad will mistake one kind of click for the other. All told, our biggest request would be better palm rejection: as is, you might notice the cursor jumping around the page, even when you didn't intentionally move it. We claimed earlier that the glossy bezel might be the most obvious sign this is a lower-end system. That's not strictly true: we weren't taking the display into account. The 13.3-inch panel here has a 1,366 x 768 resolution, which is standard across almost every laptop in this size and price class. Truth be told, the pixel count didn't bother us, and we don't think it'll be a dealbreaker for students who just need a machine for web surfing, Facebook and paper writing. If anything, we struggled the most with the viewing angles -- that glossy finish means you might have to fiddle with the screen angle before settling in to type with the notebook in your lap. We particularly noticed this while trying to work in a harshly lit office, but even then, cranking the brightness helped a good deal. The only issue then, of course, is that you'll be draining the battery life even faster than usual (much more on this later, obviously). 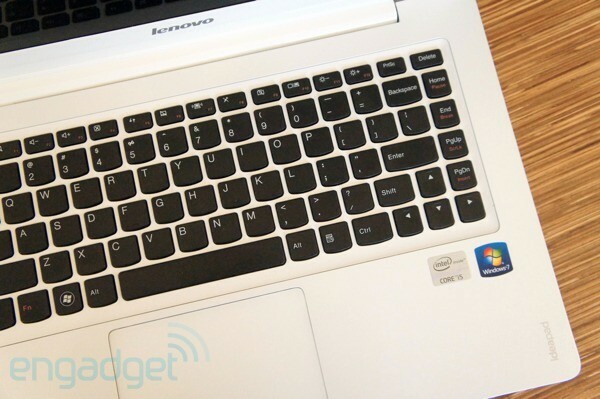 Like so many other current Ultrabooks, the U310 has Intel's Wireless Display technology built in. We'll refer you to this older review for a walk-through of the setup and streaming quality, but suffice to say it's an easy way to either mirror your desktop on a larger screen or stream 1080p video. Just be prepared to spend an extra $100, or so, on a compatible set-top box. As you might expect, the speakers here push out rather tinny sound, but then again, we're not aware of many machines in this price or size category that can do much better. We were impressed by how cool the laptop runs, but in exchange you'll have to put up with a fair amount of fan noise. In real-world use, the drive helps the machine boot in 20 seconds, coming in slightly ahead of Lenovo's 25-second claim. That's about on par with other Ultrabooks, only trailing by a second or two. Not a material difference, if you ask us. We were also impressed by how relatively cool the laptop runs, even on its bottom side, but in exchange you'll have to put up with a fair amount of fan noise coming out of the vent on the left-hand side. Like most other Ivy Bridge Ultrabooks, the U310 makes do with integrated graphics -- specifically, Intel's HD 4000 solution, which comes part and parcel with new Ivy Bridge chips. We already knew it provided a sizeable boost over the HD 3000 graphics used in Sandy Bridge machines, and indeed, the U310's 3DMark06 score of 4,549 falls within the (admittedly very large) range of scores we've seen from just-released Ultrabooks. In fact, it widely beats the T13, even though they have the same graphics. This might be a good time to consider where, exactly, you'll use your new laptop. If you think you'll be dragging it to class, you might actually care which Ultrabooks top that battery life table you see up there. But if you expect to camp out in the dorm, or find an outlet in the library, then you might not even notice you're getting an hour less battery life than the kid next to you. Take all that into account if you're considering the U310: its 46Wh battery lasted roughly five hours in our standard rundown test, which entails looping a video off the disk with WiFi on and the display brightness fixed at 65 percent. That's a good 40 minutes less than the similar VAIO T13, and even that's not the longest-lasting ultraportable we've tested. Still, it's always worth emphasizing that our battery benchmark is a grueling one, and with less taxing use, you can expect the machine to hold out a bit longer. While writing this review, we worked unplugged for about three hours, and the battery drained slowly enough that when we finally did plug the machine back in, we were hardly in danger of the machine dying mid-sentence. Admittedly, when it comes to bloatware the bar for Windows machines has been set fairly low (unless you go out of your way to buy your PC through Microsoft, which sells cleaner systems). By that metric, the U310's pre-installed software load is fairly modest: third-party apps are limited to Absolute Reminder, ooVoo for video chats and McAfee Antivirus Plus. Granted, those McAfee pop-ups can be difficult to ignore until you give in and activate the dang software. Lenovo also included some apps of its own, but these are far easier to tuck away and forget about. These include YouCam webcam software, Smart Update, EasyCamera and OneKey Recovery. There's also VeriFace if you want to use that 720p webcam for face-recognition-based log-ins. Pretty harmless stuff. As for the warranty, this shouldn't surprise anyone, but it's worth clarifying: you get one year of coverage, the same deal you'll get with almost every other consumer laptop. 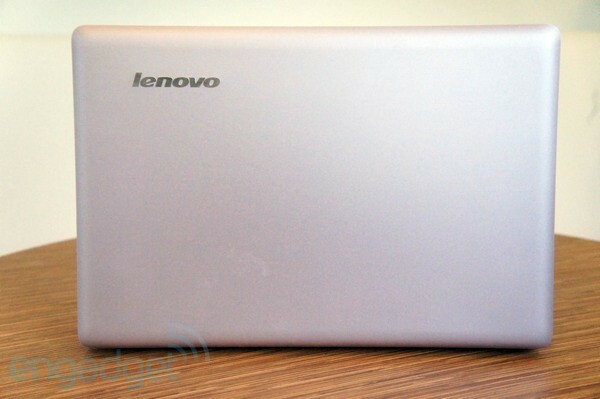 Though the specific configuration we tested goes for $799, the U310 actually starts at $750 on Lenovo's site. 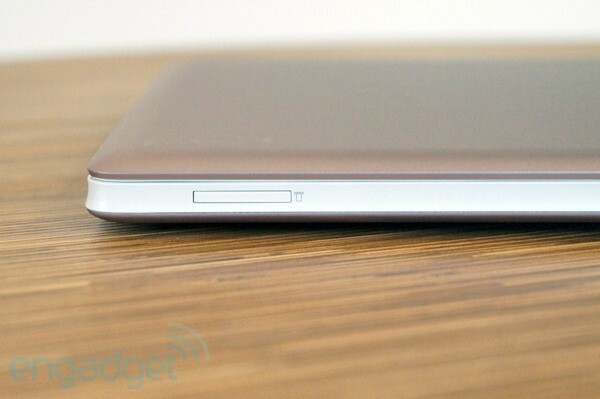 The interesting thing about the U310 is that it doesn't pretend to be anything other than a budget-friendly Ultrabook. Get too demanding regarding your specs and you'll just have to step up to the U300s, or some other high-end machine. In addition to that Core i5 CPU we tested, it's available with a 1.8GHz Core i3-3217U processor. Otherwise, the included RAM maxes out at 4GB, the resolution is fixed at 1,366 x 768 and the most capacious storage option is that 500GB hybrid hard drive we tested (there are also 320GB and 500GB HDDs available without the 32GB SSD added on). It would seem the U310 is a solid bet for the money. 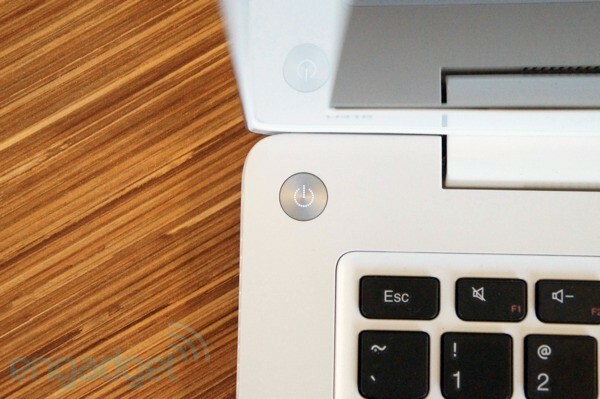 It's a great time to buy an Ultrabook, especially if you've been waiting for prices to drop. Over the next few months, you should be able to pick up an Intel-approved ultraportable for as low as $700, so you should have plenty of reasonably priced options besides the U310. Perhaps the most promising is the Sony VAIO T13, which starts at $770, offers an extra hour of battery life, a lovely metal design and a pleasing number of configuration options. Dell also just entered the budget Ultrabook race with not one, but two entries: the 14-inch Inspiron 14z and the 13-inch 13z. (To be fair, only the larger model is for sale here in the US.) Just so we're all on the same page, the 14z starts at that magic $700 price point, but the base model comes with a Sandy Bridge Core i3 CPU. To get an Ivy Bridge machine (Core i5 or i7 CPUs are available) you'll have to pay at least $100 extra. Even at the high end, you'll find the 14z is similar to the U310: it, too, maxes out at 1,366 x 768 resolution and a 500GB hybrid hard drive. Even the battery capacity is similar at 44Wh. The major differences you'll want to consider (aside from design) are the larger size, and the fact that the 14z makes room for an optical drive and up to 8GB of RAM. And let's not forget about the world's top PC maker. HP already had two Ultrabooks in its stable -- one for business types and one for people with expensive tastes -- and it's since added a line of more affordably priced ultraportables for the everyman. And mind you, we're using the word "ultraportables" very deliberately here: in addition to Ultrabooks, HP is selling so-called Sleekbooks -- lightweight machines that, for whatever reason (thickness, AMD processors), don't fit Intel's definition of an Ultrabook. As you can imagine, the models with AMD innards are cheaper, starting at $600 (not a bad deal when you remember these are fresh-off-the-factory-line Trinity chips). All told, the Ultrabooks and Sleekbooks are available in 14- and 15-inch screen sizes, and have identical industrial designs, which is to say they're constructed from a mix of metal and soft-touch material. To further simplify things, certain configuration options are the same across the board: backlit keyboards, up to 8GB of RAM and up to 500GB in HDD storage with an optional 32GB SSD to help hasten performance. Lastly, though we haven't had a chance to test it, we suggest you keep an eye on the Toshiba Satellite U845, a 14-inch Ultrabook priced starting at $700. Like other companies, Toshiba is offering a Core i3 CPU at that base price. Other specs, too, seem similar: a 500GB hard drive with a 16GB or 32GB SSD and a 1,366 x 768 display. If you just read the comparison shopping section above, you know our reviews team is only just starting to scratch the surface of lower-priced Ultrabooks. That said, it would seem that the Lenovo IdeaPad U310 is a solid bet for the money: it's attractive (save for that glossy bezel), it offers a decent selection of ports and while the keyboard and trackpad aren't perfect, they still present an excellent alternative to what you'll find on many pricier machines. We also believe that the people this is aimed at -- college-bound students, families -- could be willing to forgive some of its bigger flaws. Yes, the relative heft and short battery life could be dealbreakers for a certain sort of shopper, but not for people who intend to keep it plugged in at home or in the dorm. And we definitely don't think those folks are going to grouse about a 20-second boot time, or whatever else counts for "average" performance these days. So if you're not picky (or just can't afford to be) this guy might just fit the bill.